(from movie trailer, various voices): I’ve tried to be a serious man. We’re going to be fine. I’ve tried to do right, be a member of the community. Please just tell him I need help. 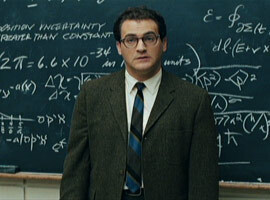 KIM LAWTON, correspondent: “A Serious Man” is a dark comedy that asks some universally serious questions. CATHLEEN FALSANI (Author, The Dude Abides: The Gospel According to the Coen Brothers): Why do we suffer? If God is there and God is a good God, why do bad things happen to decent people? I don’t care what flavor of spiritual person you are, or if you are a person of faith or not, there is no real good satisfactory answer to that. LAWTON: Religion columnist Cathleen Falsani is author of The Dude Abides: The Gospel According to the Coen Brothers. She says the brothers’ newest film grapples with those theological questions in unexpected—and yes, quirky—ways. FALSANI: It’s a powerful film, but it’s a powerfully funny film as well, and in the Coens’ 25 years of filmmaking, it’s often their funniest films that are in some ways the darkest, the most serious spiritually. (from movie): Honey, I think it’s time we started talking about a divorce. 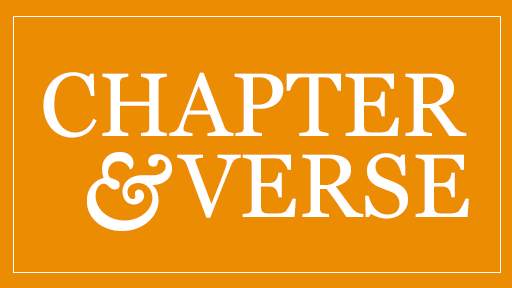 LAWTON: Set in 1967, the story centers around a Jewish physics professor, Larry Gopnick, who experiences a Job-like set of personal and professional calamities. He looks to his faith to make sense of it all. (Larry Gopnick, from movie): Please, I need help. I’ve already talked to the other rabbis. I’ve had quite a bit of tzurus lately. Marital problems, professional, you name it. This is not a frivolous request. LAWTON: He doesn’t find any easy answers. (dialogue from movie): Rabbi’s secretary: The rabbi is busy. Larry Gopnick: He didn’t look busy. Secretary: He’s thinking. FALSANI: To their credit, the rabbis in the film don’t really try to give an answer. I think they kind of encourage the wrestling out of the answer, which is, in fact, in my estimation, to continue to live your life. 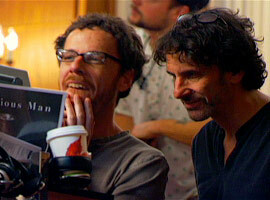 ETHAN COEN (filmmaker): The whole incongruity of Jews in the Midwest, Jews on the plains. It’s just—it’s odd, and that incongruity is something that we kind of wanted to get across, too. It’s its own strange subculture. LAWTON: They acknowledge nervousness among some Jews about how the film may come across. ETHAN COEN: People were really supportive in the Jewish community especially, but you know, occasionally people would ask, you’re not making fun of the Jews, are you? This really deep Jewish thing where, you know, is this good for the Jews or bad for the Jews? LAWTON: Like Larry’s son, Danny, the Coen brothers went to Hebrew school and were bar mitzvahed. They’ve indicated that faith no longer plays a central role in their lives, but they are notoriously reticent to discuss their personal beliefs or the messages in their 14 films. FALSANI: They don’t say a lot about what they believe or don’t, but their movies are filled with theological and metaphysical and existential questions. LAWTON: Falsani admits those themes may not always be obvious in what she calls “the Coeniverse”—the enigmatic and sometimes violent worlds the Coens have created. FALSANI: I think there is a moral order to the Coeniverse, if you will. It might not be the moral order we were hoping for, but it’s there. LAWTON: “A Serious Man” may be more overt than other Coen films in its religious exploration, but it is no more obvious in its conclusions. Still, Falsani says, in true Coenesque fashion, meaning can come by simply raising the questions. (Larry Gopnick, from movie): I need help.